My current obsession with facial hair might need a clinical diagnosis, but the boys and girls at Nike get me. They really get me. 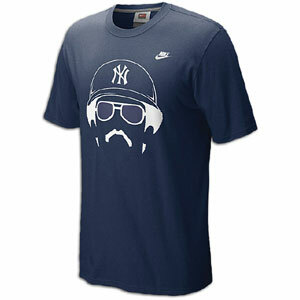 They have introduced a line of T-shirts dedicated to Hall of Fame baseball players with outstanding ‘staches, fu manchus, beards, afros and dreads. The best include Reggie Jackson, Ozzie Smith, Manny Ramirez and, of course, Rollie Fingers. 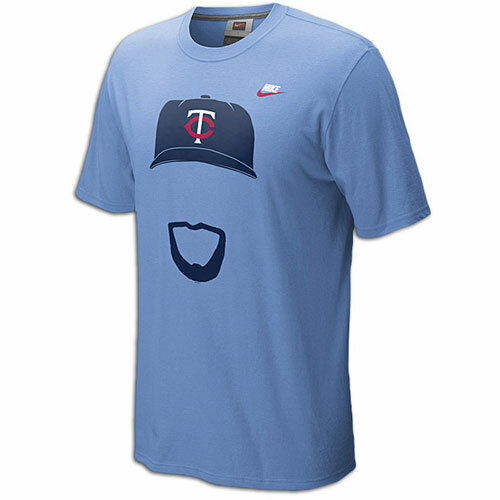 I don’t buy new clothes, but I need something to wear during the Twins World Series run this year. Overlooking the coming Casilla crash, melancholy over Morneau’s melon and being on the brink of bullpen blunders, I’m optimistic. So, here’s what I’m going to wear over a long-sleeve shirt in late October and early November. That’s good, but these three are better. The aviators make Mr. October’s the best T.
A crusty old sports reporter the Tank knows laments the fall of Sports Illustrated from top-notch sports journalism to little more than pop culture drivel. While they have pop culture graphics and blurbs, they still produce great reporting, including recent stories about Aliquippa (Pa.) High School football, Jake Plummer and the investigation into crime in college football. SI led me to this pop culture. The video is good, but not near the greatness of other Nike commercials/shorts. This entry was posted in Art and tagged Black Mamba, commercials, Hair-itage, Kirby Puckett, Kobe Bryant, Manny Ramirez, Nike, Reggie Jackson, Rollie Fingers, T-shirts. Bookmark the permalink.